I attended the third Rhinegold LIVE concert last night, which was held at Conway Hall in London. This popular Series is curated by Rhinegold Publishing, and each recital has been excellent; all very different, fresh and compelling. It’s a pleasure highlighting events such as these, because they proffer an opportunity to create an awareness of the innumerable feast of Classical concerts and recitals taking place in and around the capital. The Rhinegold Rush Hour Series provides superb artists at a renowned venue with pre-concert drinks and a post-concert interview with each performer on stage, completely free of charge. Amazing! This in itself should be celebrated. Rhinegold affords the chance to hear and meet musicians ‘up close’, and the concerts are programmed in such a way as to encourage attendance by those who may previously have found a Classical concert unattractive. British concert pianist Charles Owen (pictured above) gave an impressive recital to an appreciative, attentive audience. He began with a majestic account of Felix Mendelssohn’s (1809-1847) finest work for solo piano, the Variations Sérieuses, Op. 54, written in 1841. After stating the chorale-like theme, each thematic thread was carefully woven during the progressively intricate variations. The musical line was always clearly projected, thus building momentum towards the impassioned climax of the final variations. After taking the listener on a journey through countless emotions, the understated ending was well judged and effective. Partita No. 1 in B flat BWV 825 by J S Bach (1685-1750) was next on the programme, and for me, this was the most successful performance of the evening. Each movement was thoughtfully presented with judicious pedalling, clear articulation, plenty of tonal variety and above all, complete control. Again, we were taken through a myriad of sentiments and feelings, from sadness to sparkling humour. American composer Nico Muhly (1981 – ), resides in New York and writes in a wonderfully engaging minimalist style. Minimalism (or music with repetitive structures) has been a popular ‘trend’ in Classical music for decades, but Charles Owen had selected two of Muhly’s works which combined this genre with an edgy, urban intensity. A Hudson Cycle (2005) and Short Stuff (2009; this performance was the London premiere), were both fascinating and captivating; using a wide range of colours, rhythms, and sound effects, they oozed drama and virtuosity. A selection of Preludes from Book 1 by Claude Debussy (1862-1918), brought the recital to a close. The Preludes are mini tone poems, conjuring images and stories in sound via an extraordinarily individual harmonic language. 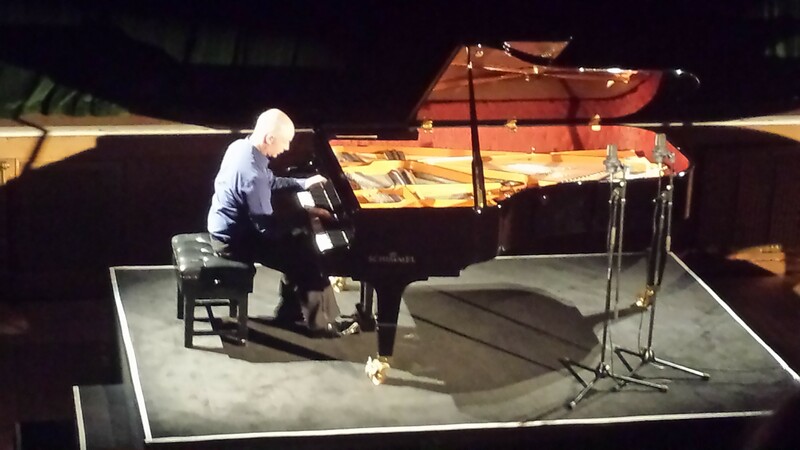 Each piece was characterized beautifully, creating an atmospheric aura employing a sea of tonal luminosity, making full use of the Schimmel Konzert Grand (which was kindly provided by Peregrine’s Pianos). 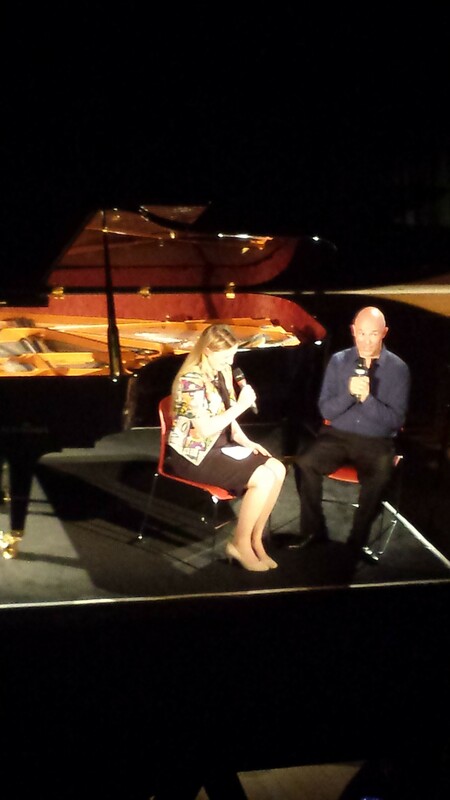 After a warm reception, the Editor of the International Piano Magazine, Claire Jackson, joined Charles onstage for a short Q&A (pictured below). This is a unique feature of the Rhinegold series; a chance to find out a little more about each performer. Charles hinted at the painstaking work which goes into every performance and gave a few pearls of wisdom to young pianists considering embarking on a concert career.